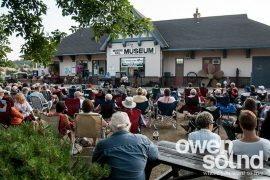 The harbour is a happenin’ place to be this summer with the Harbour Nights Concert Series | Rrampt. Sometimes I pack up my bike, tent and guitar, and roadtrip with no destination in mind. Years ago, one of these trips landed me in a city a little bigger than Owen Sound where I happened upon a free weekly concert in one of their parks downtown. There were over a hundred people gathered around a stage and I thought, why can’t my home town do this? It wasn’t long after that I was biking along the water in Owen Sound one Sunday evening (I bike a lot) and happened upon the very same thing. Only it was a little smaller. There were just over thirty people on the grass listening to music on the inner-harbour outside the Visitor Centre. I had no idea. Owen Sound was doing this. They still are doing this. They have been doing this for twenty years! And it’s grown over the years – there are now close to a hundred people who show up to these outdoor concerts. Don’t believe me? See empirical evidence below. I do see a patch of green grass in that picture, which means there’s still some room left for you and a couple friends and even your dog (if he likes music). It was soon after I realized there are many cool things like this happening around the area if you’re willing to look. And the City of Owen Sound has made it pretty darn easy to get engaged, so you don’t even have to go looking that hard. They’ve listed the schedule for this concert series on their webpage super early (it’s there now) so you can scope out all the local talent they’ve recruited and mark your calendars for the shows you want to see. I’ve been to shows by Morgan X Barrie and Tyler Beckett, Marshall Veroni, and Rob Elder, so I can recommend them for sure. I’ve heard great things about Beggar’s Road, and I’m excited to check out Madison Galloway, Settle the Ghost, Stacy Renee, and Georgian Sound Big Band. I have a feeling that this is the summer where the harbourfront will really start to become more of a gathering place. Between the new Mudtown Station, the Harbourfest in July, the TD Harbour Nights Concert Series, you might just find yourself walking the beautiful waterfront this city has to offer a little more often. So, for anyone who thinks they need to take a road trip to get a great outdoor live music experience for free, you don’t need to go anywhere but the inner harbour on Sunday evenings starting on June 17. 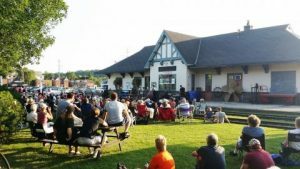 And I like the lineup so much, I decided to a weekly feature of each artist in lead-up to the Sunday concert so you can know just what to expect as you claim your small piece of real estate along the harbour, unfold your lawn chair and settle in for some sweet tunes to close out your weekend. Stay tuned for our weekly feature, and stay awesome this summer.